The subjects were using non-destructive methods using thermal imaging differential heating of the deck. 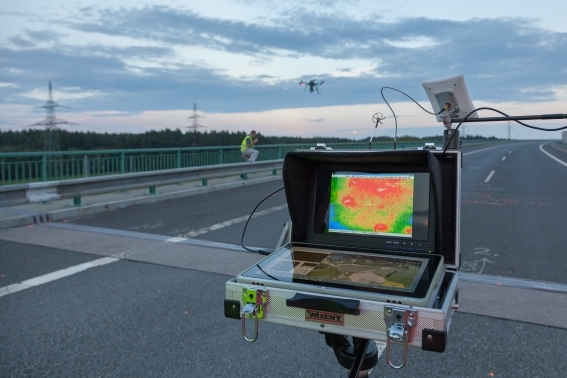 Small thermal camera was placed on a special hexacopter and mapping was performed from various heights to determine the needed critical locations and for the control. Everything was carried out under specific conditions (air temperature, road temperature, cloudiness etc.). Thus, it was revealed damage to the road, the location of the insulation or drainage, which shows different temperature. Every image with overlaps is placed directly in the coordinates and can therefore places that are not visible to the trace and draw their exact location, either on the ground online or on a map. 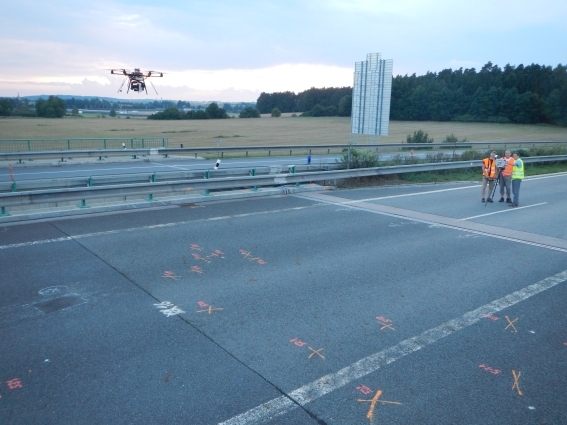 Mapping from the air can monitor the road more quickly at a high angle shot. In addition, thermal imaging is visible online at the monitor on the ground and it can be easily mark critical points in terrain identified for repair. 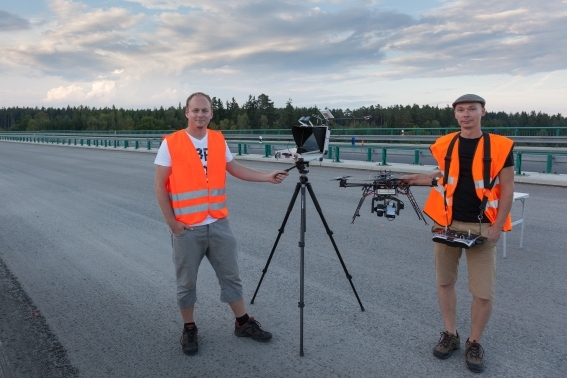 The actual movement of the drone is possible to plan and moving is fully automatic or can be manually controlled remotely over the necessary places. UAV flights were for mapping all found bulges while thermography record their actual shape below the surface, and identification of other bulges that have not yet been found and are not a common sight to see. Also on thermal image can be seen an isolation, that is about 8 cm below the surface. 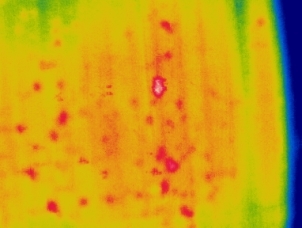 On the thermal image showing expansion joints with higher temperature. RMD this modern way fairly easily detected before taking over buildings or during reconstruction or whether the building is fine, or effectively map out the locations to repair or complaint. 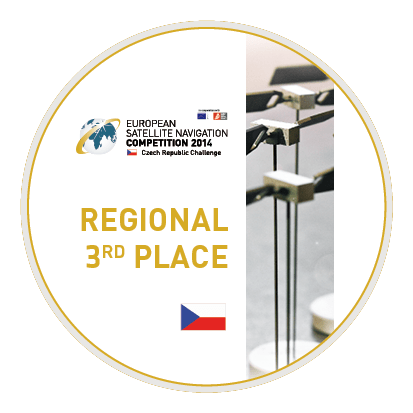 This project is included in project from Jakub Karas (UAS manager and partner UPVISION) with name “Precision mapping line constructions by UAS”, with which got 3rd place in regional round European Satellite Navigation Competition 2014 (Galileo Masters), from Ministry of Transport in Czech Republic. This entry was posted on Thursday, December 11th, 2014 at 12:34 pm. You can follow any responses to this entry through the RSS 2.0 feed. You can leave a response, or trackback from your own site. Thank you fior your question. It is hard to anewsr exactly at this moment. 3D technology used in design of MQ-8b kit is not that chip for us. Of course we can set price high, and quality of model will make sale. But we work different way, we try to make models reasonable priced for modelers. We need some more days to see current market response to know the price level.Stay tuned, subscribe newsletter to be informed first and to get more privileges!